The bot gets stuck when the camera angle isn't it the correct place. At which obstacle does that occur? its after the tube at the end of the course, the camera can't see the log to re-start the course and just sits there. 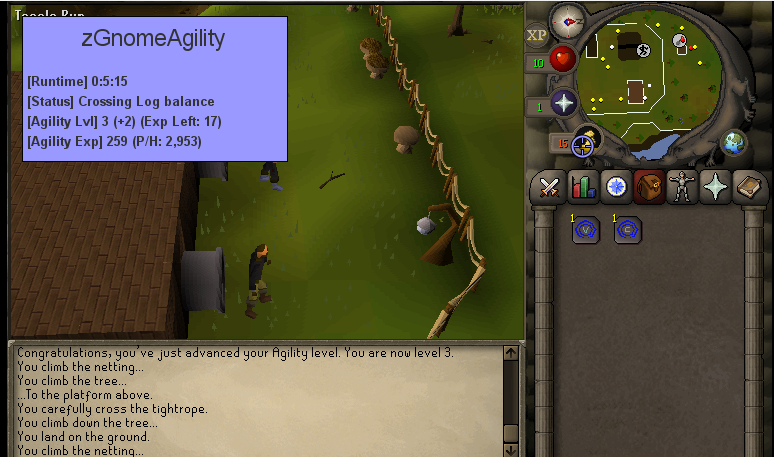 this script got me from 1-20 agility in less than 30 minutes. had a steady 8,5k exp hour with me manualy drinking energy pots. the only fail that ocured is on the net obstarcle when it clicked on a gnome and made me walk to the side of the net. then when trying to click on the net it gets the message "you can not do that from here"
I'll update it in 2 weeks, got exams. script works great, just make sure you're zoomed out! thanks again. Works as of August 2nd 2017 , just zoom all the way out. yeah just make sure you are zoomed all the way out. edit: just learned how to minimize the zoom and its working fine now. how do i download this script? i am new to this whole rsbot thing. i have used it back in 2010 though please help?? ?